Nu (ヌゥ,) are sleepy creatures that can be found in all time periods. Nu are blue, with long, stringy arms, small eyes, and a small tuft of green hair. More Nus are found in 12,000 B.C. than in any other era, almost always sleeping. Within a secret room in Enhasa, a book entitled "The Mystery of Life," vol. 841, chapter 26, authored by Belthasar, states "All life begins with Nu and ends with Nu. This is the truth! This is my belief! ...At least for now." In 65,000,000 B.C. a Nu can be found in the Hunting Range when it rains. Also at the End of Time, the final form of Spekkio, the magic trainer and God of War, is a pink Nu. This Nu is one of the strongest enemies in the game. 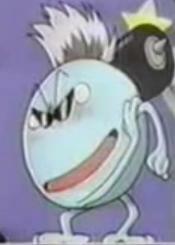 A Nu also appears as one of two central characters in the Chrono Trigger promotional anime Dimensional Adventure Numa Monjar.